Today we’re going big or going home. 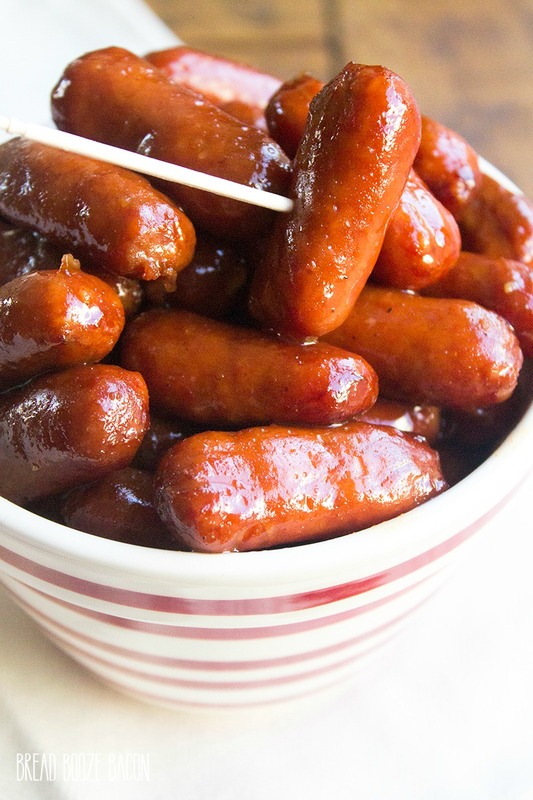 While these Bourbon BBQ Little Smokies look pretty unassuming, they’re actually mini flavor bombs just waiting to off in your mouth. Are you excited? Because you should be! These cocktail links are perfect for every kind of party out there. Backyard barbecue? Check. Holiday party with all your family? Check. Watching football? Check. You get the idea. To a small crock pot add BBQ sauce, brown sugar, bourbon, hot sauce, paprika, and ground mustard. Whisk together. Add little smokies and stir to coat in sauce. Cover slow cooker and cook on HIGH. 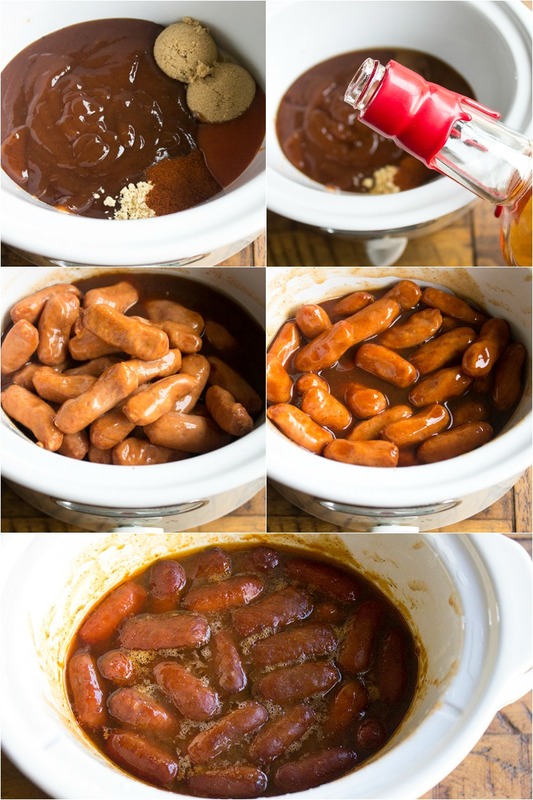 This little smokies crockpot recipe is super simple and combines classic flavors for the perfect sauce to bathe these little smokies in. Rich and sweet from the BBQ sauce and brown sugar with undertones of bourbon that’ll leave you looking for some bread to sop with the extra sauce with. I’m not kidding. When you make this, hide some for yourself because they’ll disappear almost immediately when you put them out for everyone to enjoy. And if you forget, don’t say I didn’t warn you. With the biggest football game of the season just two short days away, I’m planning our party menu. I’m going all appetizers this year! 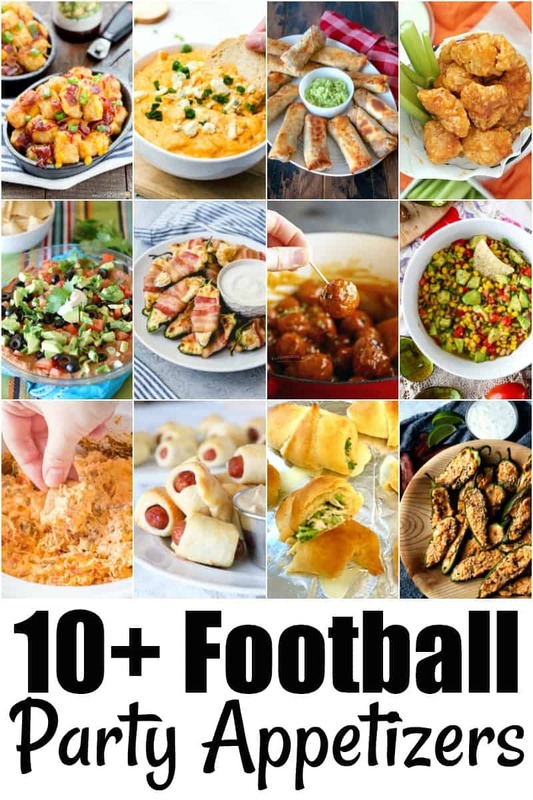 If you need some recipe inspiration, be sure to try these crazy good football party appetizers by clicking the links below! 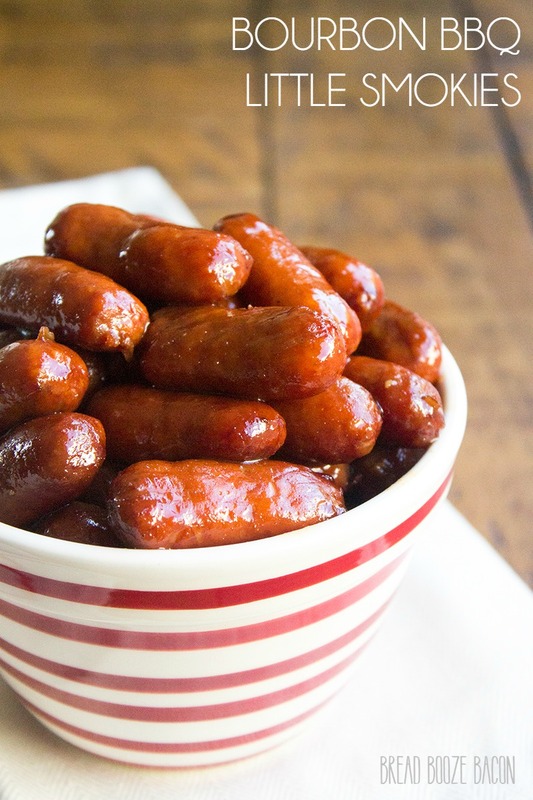 Bourbon BBQ Little Smokies are a flavorful appetizer that's easy to make and oh so good! They are the perfect fit for any occasion or get together! To a 2-quart slow cooker, add the BBQ sauce, brown sugar, bourbon, hot sauce, paprika, and ground mustard. Stir until well combined. Drain the little smokies links and add them to the crock pot. Stir everything together, making sure all the smokies links get coated. Reduce heat to WARM until ready to serve. Stir the smokies links in the sauce. If serving from the slow cooker, recover the smokies links and you're done! If using a serving bowl, spoon the smokies links into the bowl and then spoon some of the sauce that gets left in the slow cooker over the smokies. Serve immediately. Use your favorite BBQ sauce for this recipe. I went with a spicy honey BBQ sauce to play off the other flavors. You can substitute your preferred hot sauce in this recipe if you don't care for Frank's. 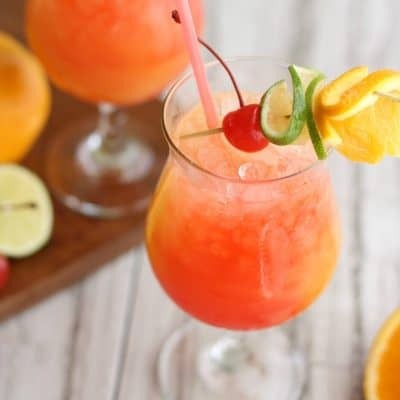 This looks wonderful!! 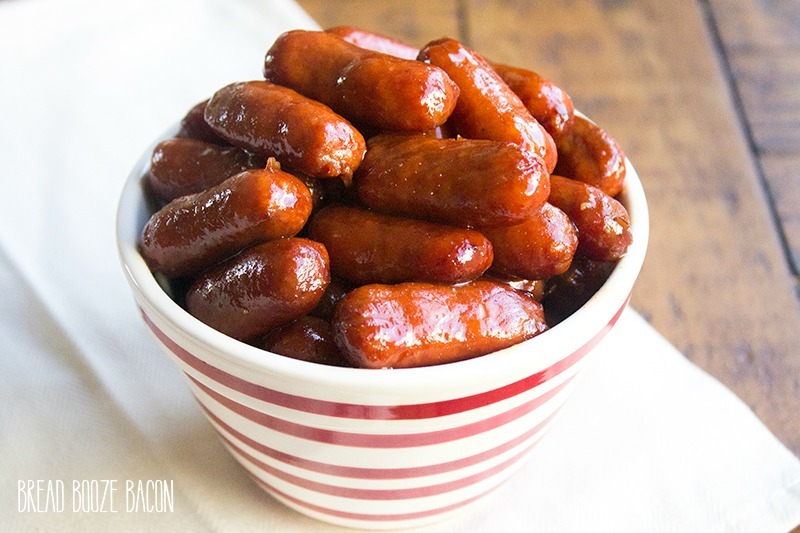 I love your take on these Lil Smokies which seems to be everyone’s favorite appetizer. I can’t have a get together without those delicious little weenies. This recipe is refreshing, because honestly, I’m so tired of the grape jelly method. Your version is gonna be AWESOME! I can just imagine all the flavors! Can’t wait to try this on a bunch of unsuspecting guinea pigs…. uh… I mean… guests… LOL. Thanks for sharing this! These are fantastic as is, but I replace the sugar with medium-dark Vermont maple syrup. Rich & super delicious!! Ooooo! That sounds SOOOO good!! These are terrific!! Such a great combo with the bourbon and hot sauce addition. Everyone loved them! Thanks for sharing! The only recipes I could find were the grape jelly and chili sauce ones – yuck:-( This recipe wasn’t too sweet – just right!! I’m so glad you loved them Pamela!! I got tired of the jelly/chili sauce too. It’s fine, but I like to mix things up! Thanks for this recipe!!! I’m gonna try it tonight for the game!!! Roll Tide!!!! Oh – I love these and will be making a batch for game day!! Ooooooh, these are so great. Bourbon bbq sounds PERFECT for little smokies. Can’t wait t try them! These are always a hit at parties.